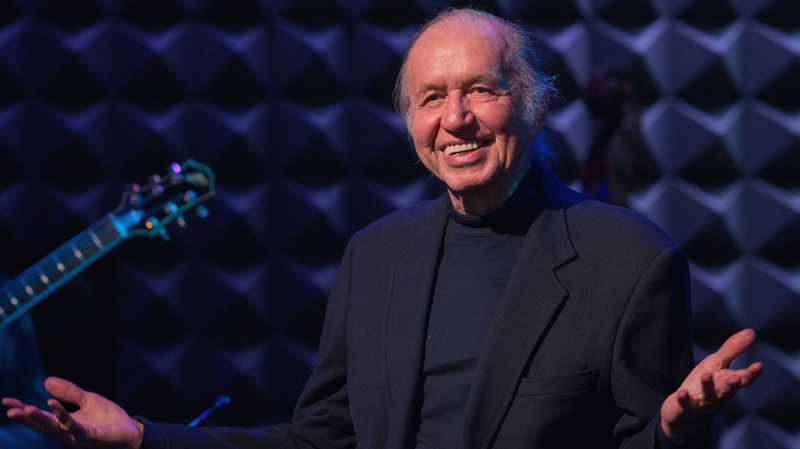 Bob Dorough, Jazz Musician Best Known For 'Schoolhouse Rock!,' Dead At 94 : The Record Dorough spent two decades as a jazz player, singer, conductor and arranger in New York before being approached, at his advertising day job, to explain math to children via music. Bob Dorough, whose career began as a composer, arranger and singer in the booming New York jazz scene of the '50s and '60s before he became the musical keystone of Schoolhouse Rock!, died Monday afternoon in Mt. Bethel, Penn., his wife, Sally Shanley Dorough, confirmed to NPR. He was 94. The Arkansas-born, Texas-raised Dorough began working in music in the army, serving as a composer, arranger and player in the Special Services Army Band between 1943 and '45, before getting a Bachelor of Music degree from the University of North Texas. In the late '40s, Dorough made his way to New York, working there as a pianist and singer. He released his debut album, Devil May Care, in 1956 on Gus Wildi's Bethlehem label, also home to Nina Simone's first album. Devil May Care was a document of loungey bebop, with Dorough's windy, charming and idiosyncratically accented singing of buoyant lyrics that hinted at his success to come. "In a dream / the strangest and oddest things / appear / and what insane insane and silly things / we do," he sang on "I Had the Craziest Dream." Dorough collaborated with Davis on the serrated holiday song "Blue Xmas (To Whom It May Concern)" and later sang on "Nothing Like You," the closing track of Davis' 1967 album Sorcerer. As critic Ben Ratliff wrote in notes accompanying a vinyl reissue of Sorcerer last fall: "The trumpeter Leron Thomas recently told me that he thinks of it as Miles's version of a Looney Tunes move: 'That's All, Folks.' "
Then, in 1971, with the jazz money running thin, Dorough was asked by his boss at the advertising company where he had a day job to set the multiplication tables to music; his boss cited his children's ability to remember Hendrix and Rolling Stones lyrics, but not their school lessons. "I got the idea that three is a magic number," Dorough told NPR's Rachel Martin in 2013. "Then I looked in the magic book and sure enough, three is one of the magic numbers." That concept became the song "Three Is a Magic Number" and the project would become the Grammy-nominated Multiplication Rock. Originally intended as a school workbook, the concept was pitched and sold to ABC executive Michael Eisner, becoming the first of the long-running Schoolhouse Rock! series of educational cartoons that became an all-but inseparable part of of '70s and '80s childhood. After the fully Dorough-penned Multiplication Rock, the series' contributors expanded to include Lynn Ahrens, Dave Frishberg (writer of "I'm Just a Bill") and George Newall, with Dorough staying on as musical director. Expanding to cover grammar — Dorough's least-favorite subject to pen music on — American politics and history and science, the initial series ran for 12 years and was revived in the '90s. The tribute album Schoolhouse Rock! Rocks, recorded by indie artists that had no doubt grown up watching the series, was released in 1996. It featured reinterpretations of the now-famous tunes, including Dorough compositions "Conjunction Junction" (Better Than Ezra), "Three Is a Magic Number" (Blind Melon), "Electricity, Electricity" (Goodness) and "Lolly, Lolly, Lolly, Get Your Adverbs Here" (Buffalo Tom). Later in life, Dorough became a mentor to the British-American singer, actress and comedian Nellie McKay, whom he first met in 1997, McKay tells NPR. "He was leaving Professor Pat Dorian's office at East Stroudsburg University — even in an academic setting, he glowed with health and good cheer, spreading sunshine wherever he went," McKay says. "Lou Reed's idea of hell would be to sit in heaven with Bob Dorough," McKay says, referencing the famously cantankerous New York rocker. Dorough himself continued to play live for the rest of his life — at 92, Dorough performed "Devil May Care" for member station WBGO — and as recently as three weeks ago in upstate New York.